A petite redhead stares out the window from her ward in United Hospital. Dhaka’s skyline is unusually gloomy, but appropriate in the circumstances. Eszter was robbed of that opportunity within six hours of arrival — along with her bag, passport, credit cards – and 20 percent of her skin. When a nurse enters to check on her dressings, Eszter begs for more painkillers but is told she must wait another half hour. She is crestfallen, but somehow finds the strength to recount a brutal mugging that took place three days earlier. After settling into a hotel in Gulshan 1, Eszter and her travel companion decided to have dinner at The Eight. As it was nearby, the hotel’s receptionist recommended they travel by rickshaw rather than CNG. Once outside, a local told the rickshaw driver where to go – but, unbeknown to Eszter and Andrew, the driver proceeded in the direction of Banani. As the rickshaw approached Kamal Attaturk Avenue along Banani’s Road 11, a hand stretched out from a passing car and grabbed Eszter’s bag, which was strapped diagonally across her waist. She hit the road like a brick, but for a few seconds desperately tried to resist losing the contents of her bag. Andrew watched in horror as his friend was dragged along the road at a high speed for around 150 metres, before the muggers eventually released their grip and sped off. Andrew spent the next three days battling with an insurance company to move forward their return flights and to cover medical expenses. When he arrived to visit Eszter around nightfall, he appeared pale and drained. 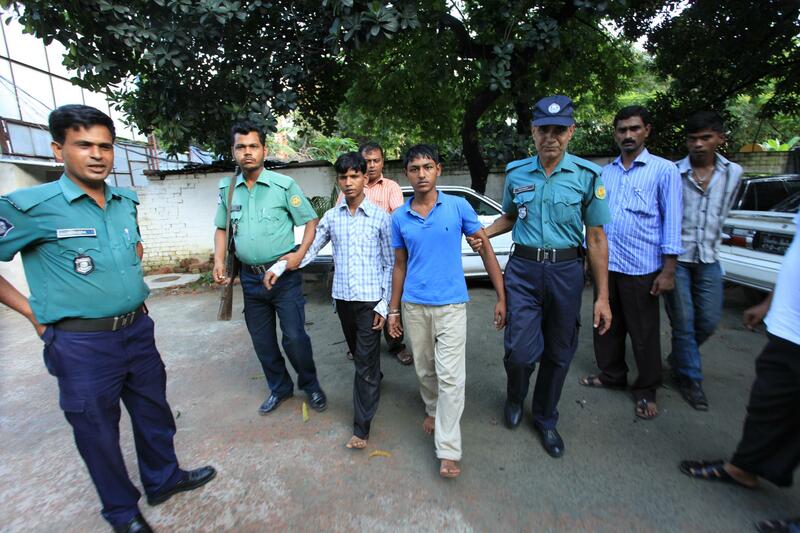 Immediately after the attack, Andrew had called Kamal, the only person he knew in Bangladesh. When he arrived on the scene, Kamal was horrified by the gravity of Eszter’s injuries. While receiving initial treatment in a small emergency room in Prescription Point, Eszter shook as she tried to hold onto the bed; she was barely able to stand, but sitting down was out of the question. When the police arrived, they refused to take a statement and insisted a general diary be filed at the station. Andrew complied on the incapacitated victim’s behalf. After visiting Eszter in hospital on that grey afternoon, I was so disturbed that I couldn’t sleep until noon the following day. Not only was the crime utterly reprehensible, I knew it wasn’t a one-off. A couple of months earlier, I’d heard of another woman who had suffered a similar fate; though some of the details were even more sinister. The victim described her ordeal to The Independent on condition of anonymity. “A” had arrived home with a friend one night when a car pulled up as they were knocking at the entrance gates. Before the security guards appeared, the victim saw a group of men jump out of the car and run towards her: she has no memory of what followed next. Her friend, who was not targeted, watched the men beat “A” with a gun, stick and shoe, while trying to pull her inside the vehicle. The next thing “A” remembers is being dragged along the road by her arm, while the attackers pointed a gun at her face. Her head was centimetres away from being crushed under a tyre. After 100 metres or so, the criminals released her and took off with her bag. “A”s feet, legs, hips, arms, torso and head were injured, and a wound on her knee required stitches. A considerable amount of skin and flesh had been scraped off her shin, so she was referred to a plastic surgeon. According to Officer in Charge of Gulshan Police Station Shah Alam, incidents of mugging by “car-dragging” began five years ago. The tactic is reminiscent of the violence depicted in the film A Clockwork Orange; where a young psychopath called Alex leads a gang that engages in “ultra-violence” for pleasure. Material gain is not the aim of their game. Although many of “A”s friends and family members provided sympathy and support, others said she’d asked for trouble by staying out late. In Bangladesh, as well as many other parts of the world where feminist movements to “reclaim the night” have not taken place, there is a perception that the night “belongs” to men. Unsurprisingly, “A” said that the patriarchal attitudes expressed impeded her recovery. Many foreigners revel in Dhaka’s nightlife, whether it be foreign clubs or house parties, but a significant proportion cannot afford to follow the United Kingdom’s Foreign Office’s safety and security advice for Bangladesh, which is in line with that of most other nations – to travel by private car. The foreign office’s website cautions that, “Passengers using ”cycle rickshaws” and ”CNGs” or traveling alone in taxis are particularly vulnerable, especially at night. If traveling alone, you should try to avoid using public transport. We do not recommend ”cycle rickshaws” as a safe mode of transport.” Moreover, Associate Professor for Sustainable Development at the University of Liberal Arts Bangladesh Rathana Peou said that several interns have been mugged in the morning while traveling to work on rickshaws. An embassy on request of anonymity told The Independent, “We are aware of at least fourteen incidents of robbery or mugging against foreign nationals in the Gulshan 1 and 2 and Banani districts so far in 2011.” Although the statistics are not comprehensive, each of those reported were using public transport or walking at the time, and most attackers used firearms or bladed weapons. “Write that down,” he added. Alam reported that over the last four months, he has arrested 18 muggers and recovered six cars – every time, it’s been a white Toyota Corolla. 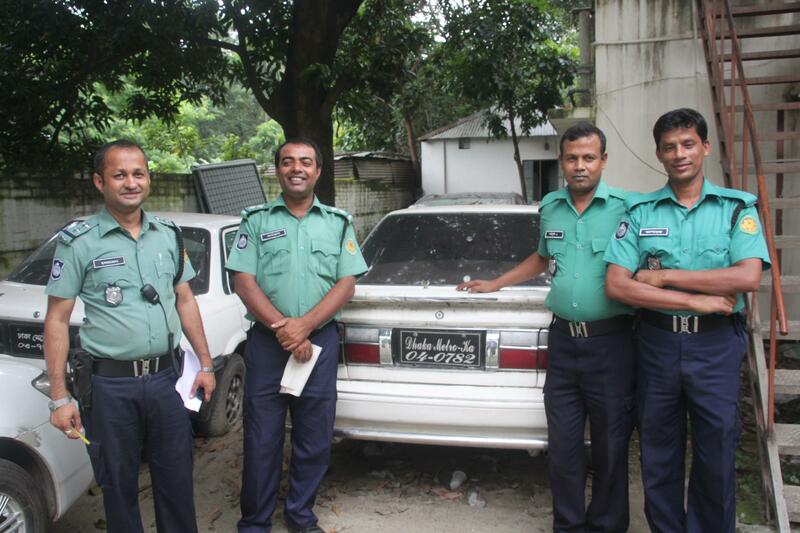 Several lie rotting at Gulshan police station. However he also pointed out that more funds are needed in order to catch more criminals – he has enough personnel, but an inadequate number of vehicles to patrol the streets. When I asked for an emergency police contact number, Shah Alam said, “999.” However when I then tried to dial the number using my mobile phone, he informed me that it only works from a landline. The alternative offered was 0119 100 1144, and he said he would ask his superiors to make 999 calls operational from any type of phone*. While conducting research about muggings in Dhaka, I was overwhelmed by the number of foreigners and Bangladeshis who contacted me to describe their personal ordeals. According to Shah Alam, “Crime in a general sense has gotten worse.” Sadly, perhaps it will have to get even worse before it gets better. * On October 3 2011, Gulshan police advised that there is now a 24-hour help desk at the Gulshan Police Station to assist foreigners who are victims of crime in the diplomatic zone. Foreign victims of crime can contact the 24-hour police hotline for assistance on this number: 0171 339 8355. Doesn’t matter which country you go to in the world there are evil scum who will do bad things to people so Dhakka is no exception. Always take where ever you are. Agreed, it’s not good at all – but your friends will be vigilant if they are aware of the danger. Thank you for sharing it.